About a month ago, I wrote about a librarian who has been using Screenflex for over 15 years. Mike worked at an elementary school where his Screenflex dividers were used several times a day. Mike took a job at the Marcellus High School in the Fall of this year and convinced his old school to allow him to use one divider. 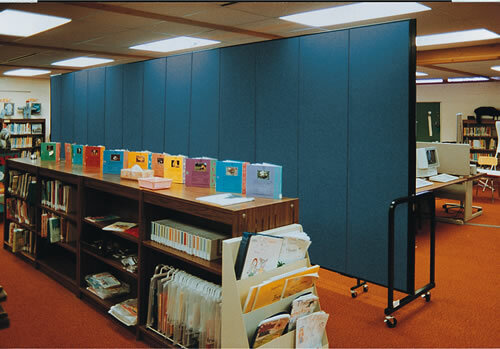 Shortly after he started at Marcellus High, Mike put in a request to buy a Screenflex room divider for his new library. The library had some space issues that needed some attention. Originally, the dilemma that the high school library staff faced, was that they had to limit the number of kids coming into the library to only 30 students. In order to keep sanity in the small area available in the library limits had to be put in place. Mike used Screenflex at the elementary school where he previously worked and felt that a couple of dividers would be a perfect solution for dividing the space in half and creating a private room to allow more students to use the area at the same time. Mike hoped to have enough space to hold a class on one side of the divider and on the other side of the divider a spot for students to enjoy normal use of the library without distractions. Just one month after speaking to Mike, his request was finally approved and he placed the order for his new Screenflex divider. When the new divider is in place, Mike will be able to provide room for 70 students in the library at the same time. The dividers will serve as two separate areas. One area will be used for students to study, while the other area will be used as a classroom for teachers. Dividers will also be used to provide a place for testing when needed. The best part of all is that when the dividers are not in use, Mike can fold them up in seconds and store them in a space about 2′ x 3′. Thank you, Mike, for sharing your story with us. We also thank you for using our product for 15 years and choosing us again. We strive had to meet the needs of our customers which earns us a 4.9/5.0 customer satisfaction rating.